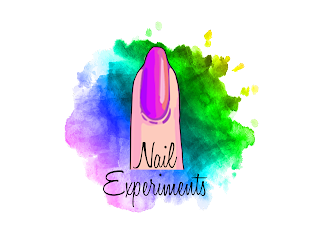 Nail Experiments: Bougie On A Budget | How I DIY'd My Nail Polish Desk From Drab to Fab On A Budget! Bougie On A Budget | How I DIY'd My Nail Polish Desk From Drab to Fab On A Budget! 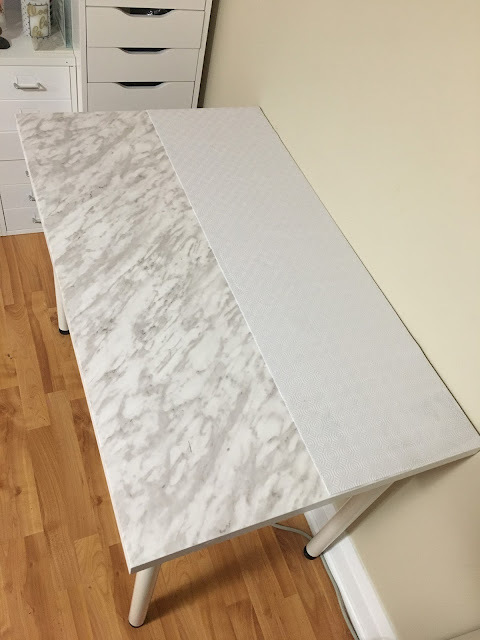 How I DIY'd My Nail Polish Desk From Drab to Fab On A Budget! Hey everyone, welcome back! I'm super pumped to share this very affordable DIY (bougie on a budget) in how I took my cheap nail polish desk from drab to fab! I'm actually going to be starting a series here on the blog called, you guessed it - bougie on a budget! I've always loved DIY's and figured it's about time I share them with my fellow readers! 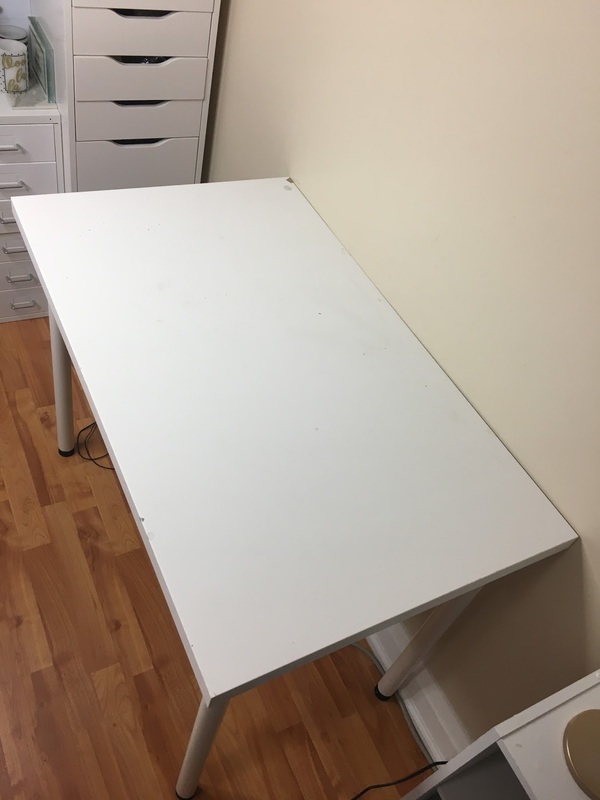 I originally purchased my white table top from Ikea and believe it was around $20 - very affordable. Over time, the table top was looking pretty drab with stains and scratches - not a cute look. 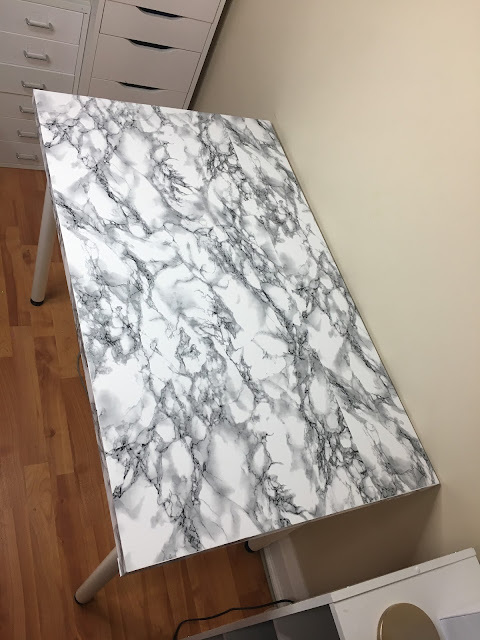 I'm obsessed with all things marble and wanted to incorporate that look onto my desk without dishing out the big bucks. Gotta fake it till I make it! 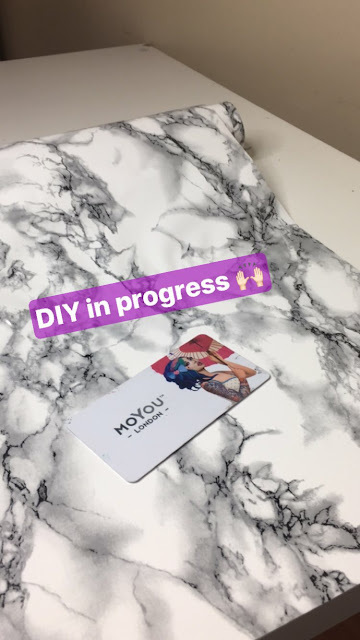 I found a roll of marble contact paper at Dollarama for $1.25, being very affordable but it just didn't have a very realistic marble look to it. 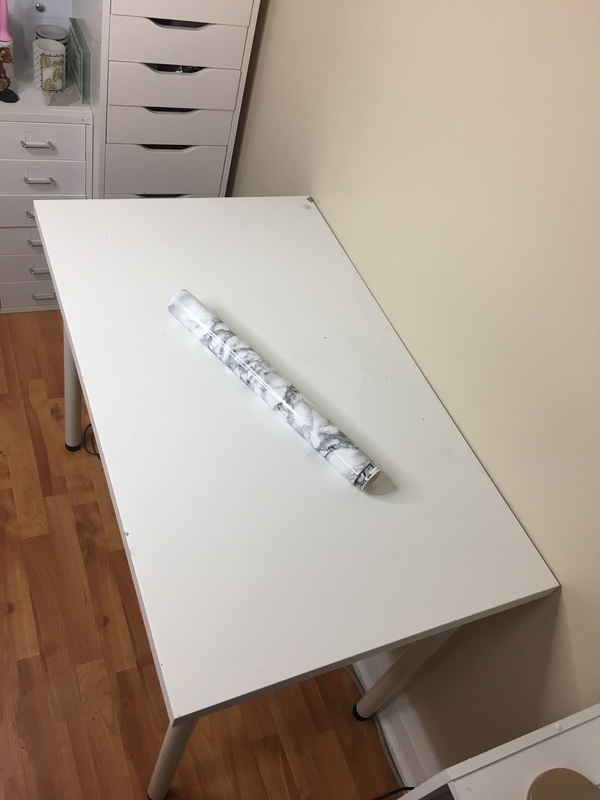 I also underestimated how many rolls I had, assuming it was 2 full rolls and instead I had 1 1/2 rolls - not enough to cover the entire table top. The white area near the top is actually a white drawer liner from Dollarama and used it to cover the void space. I could have gone out and purchased more to work with, but I knew I didn't love the look of it enough to keep going and needed to find something more realistic looking. Side note: The white drawer liners from Dollarama are actually pretty awesome and have them in every Helmer drawer where my nail polishes are stored in. I can't tell you how crazy it would drive me whenever I'd open up my nail polish drawers, they'd go flying all around within the drawers. The drawer liner helps things to stay in place and provides a nice grip underneath my nail polish bottles so things don't go flying about. I searched all around for better looking marble contact paper and finally found some on Amazon - adhesive film (more like vinyl - very durable). 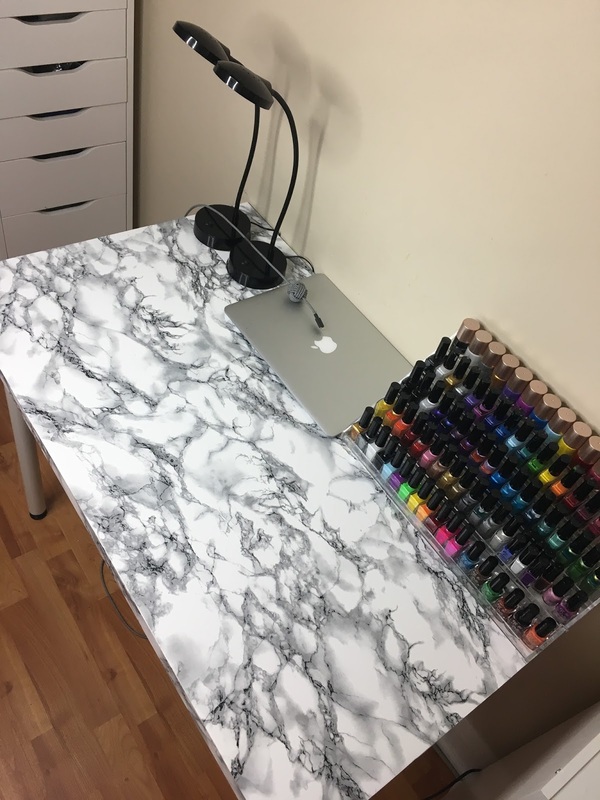 The roll was $14, still affordable but definitely not $1.25 Dollarama affordable but I'd rather pay a little more to get a better looking marble look ya know? 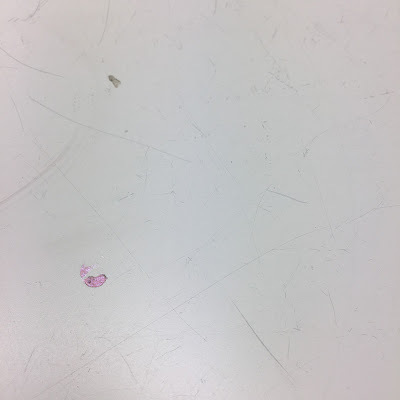 I peeled off the previous Dollarama marble contact paper and started fresh! When applying contact paper, you want to work slow and make sure to have something to help you smooth out air bubbles. I used one of my stamping plates as the edges were smooth. 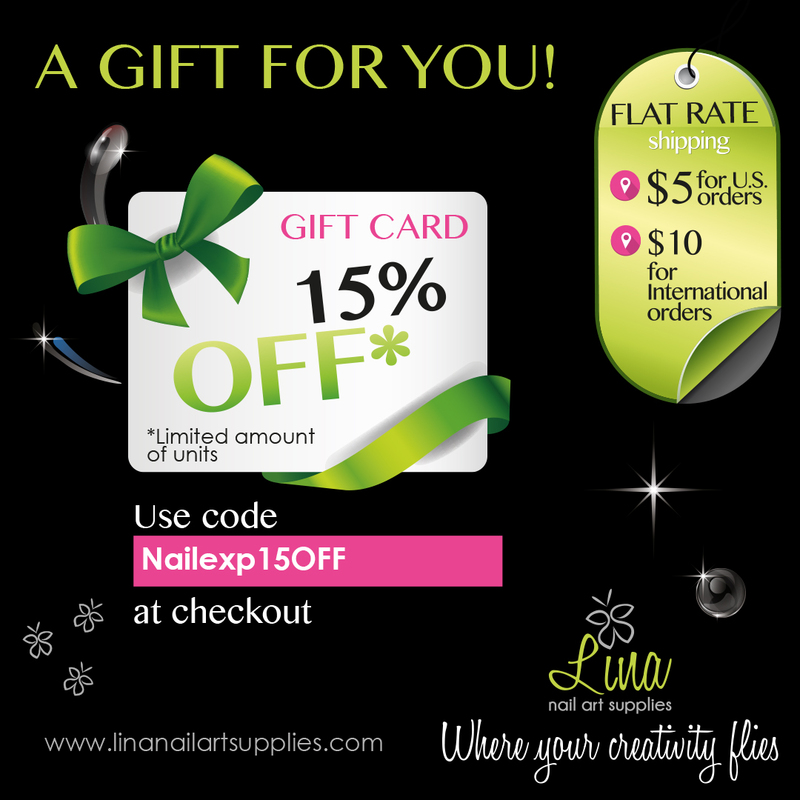 You can use a ruler or anything else you find handy that has good grip and smooth edges. 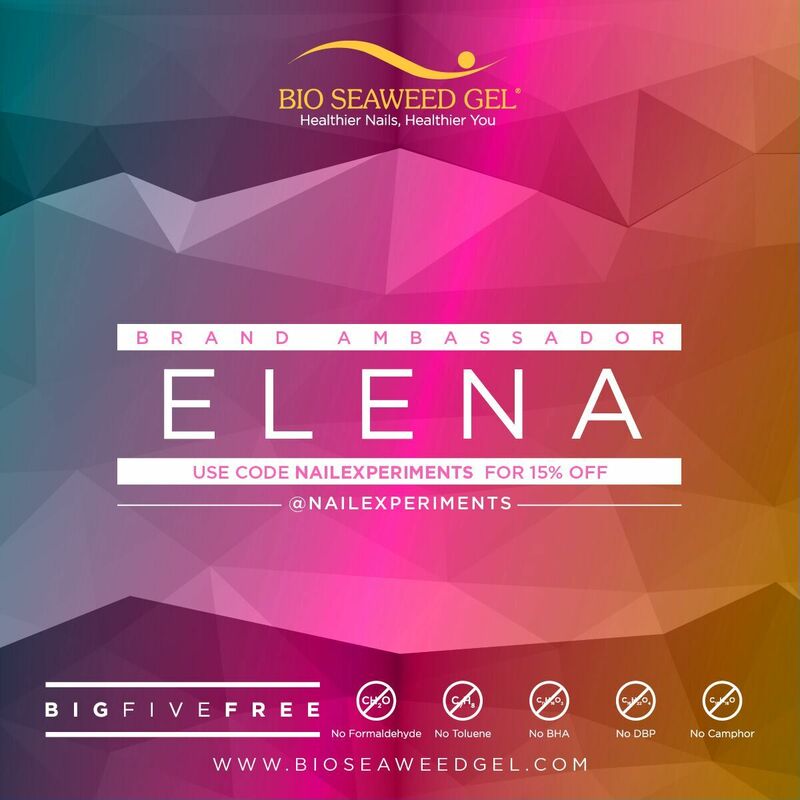 When smoothing out air bubbles, use medium-firm pressure scrapping them outwards. The final product! 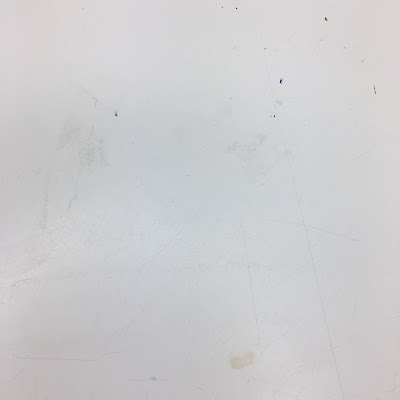 I even made sure to cover all the edges of the table, as it makes everything look more put together. I couldn't be more thrilled with how this turned out and now I have a gorgeous faux marble table top .. bougie on a budget at its finest ladies and gents! The quality of this is more so vinyl and seems pretty durable! The dollar store version didn't seem as durable but could still work. The finish of the final result was a bit glossy, giving a realistic look - I love it! Would you, my lovely readers be interested in having me continue the 'bougie on a budget' series? I'm very into DIY'ing ordinary things and transforming them up a few notches. I'd love to share my projects with you, so let me know in the comments down below if you'd like to see future DIY's. I was watching this on snapchat as it was in process! :) I love this series! Do more! I have a white desk as well and a glass overlay. I'd love to do something underneath. I was also thinking of doing brand business cards so I can see through the glass. Wow this came out so well! What a great way to amp up a dying tabletop! You really turned that table into a whole new one. Well done! Ouu girl it looks so good!!! !